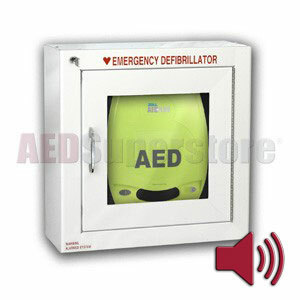 ZOLL® AED Plus® Standard Size Cabinet with Audible Alarm. This cabinet contains a bracket exclusively for use of the ZOLL AED Plus model defibrillator. Door-activated audible alarm alerts everyone in the area the AED has been deployed for rescue. Super Job from AED SuperStore. Corrected my order mistake first thing in the morning after I ordered and put the shipment all together so there was no stray parts that I had to wait for. Cabinet fit well in the wall and looks great. Could have used screws to secure it to the studs in the wall, but that is no big deal. AED Superstore Staff Note: As you mentioned, mounting hardware is not included with our cabinets - this is because there are several different types of walls, each requiring different mounting methods and hardware, and we do not know which type of wall each customer has. Thanks so much for the feedback. Great job. 2nd one I've purchased; good quality; very happy with cabinet.